In every episode, our host Curtis Childs encourages viewers to send in any questions that come to mind—but he doesn’t always get a chance to answer every question. In this episode, he and featured guests put their heads together with the spiritual writings of eighteenth-century philosopher Emanuel Swedenborg to answer these pressing questions. So is this the last church? And if so, what is next, according to Swedenborg? Is the most recent Last Judgment the last last judgment or will there be others? If the interior meaning has been revealed once again, as it was with the Most Ancient Church, what else is there? If churches have different dispensations and following shadow periods, can we not see another repeat of the Last Judgment as time and history repeats itself? This time pushing more into good though? Swedenborg wrote that the most recent Last Judgment, which took place in 1757, was the last one the Christian church will have to go through. Dr. Jonathan Rose shares some biblical support for the idea that there will be a final, complete Christian church in the future. 2. 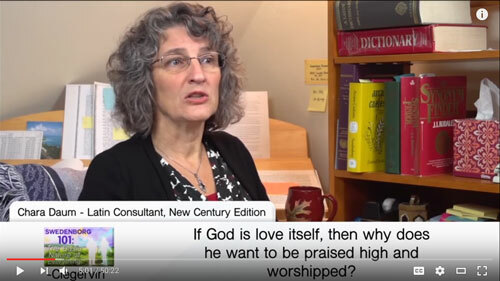 If God is love itself, then why does he want to be praised high and worshipped? Swedenborg describes love as a partnership and a unity. Chara Daum explains how we can achieve a heavenly mindset if love, peace, and selflessness are our priorities; this, Swedenborg says, is true worship, and it’s what God wants for us. This kind of worship serves us as much as it serves God. 3. So are we constantly being judged? And if so, is it for our own good out of love? As Jonathan explains, everything is spiritually recorded, but it is not judged. What happens after death in the spiritual world is that our true nature is revealed as we are stripped of deception. Every effort is made to get us the best possible outcome—a home in heaven rather than hell—thanks to mercy and love. 4. Did Emanuel Swedenborg talk about taking the Bible literally or more by symbolism? Swedenborg’s first and biggest theological work was a word by word analysis of the biblical books of Genesis and Exodus to identify hidden meanings and reveal how the Bible is the story of our spiritual life, says Chara. What we might call symbolism, he called correspondences. The literal sense contains the higher levels, so both senses are important. 5. If God did not create the Hells, then who created it? God did not create hell (or the hells, as Swedenborg often says), but he did give humanity free will, which allows us to create our own finite realities, such as hell. Since humans are not God—who is defined as goodness itself—they are not intrinsically good. Chelsea Odhner shares how when we turn away from the goodness of God, we can travel into the dark. This freedom is both what makes us human and why God chose to make us. 6. 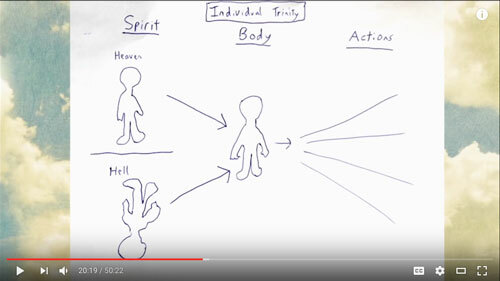 What does Swedenborg think has gone wrong with the Trinity when someone tries to mass murder people? What do you suppose he would say? Curtis explains how a system that was built for good can sometimes also allow things to go very wrong. This is what happens to the trinity inside a person (the soul, or life and love from God, entering a human being and emerging through actions of love and goodness) is perverted to the point that people can commit horrible acts of violence. If we have a love for evil—earthly power or material things—the free will that empowers us to spread good allows us to spread evil instead. In that way, our personal trinity can act in a way other than intended. According to this, most of the world is going to hell. All people have some form of evil in them. I wonder if Swedenborg talks about grace at all. And if he did, what interpretation of it did he get? What does “we are saved by grace” mean according to Swedenborg? Jonathan tackles this one: Swedenborg differentiated between the hereditary evil we all have because we are human— “original sin”—and active evil, which is what we choose to do. It’s the active evil that we are held spiritually responsible for. Or, to put it another way, it’s the choice to do evil that might land us in hell, not something that we do unintentionally. But even if we do sometimes choose evil, we can repent of it and reject it to become better people. That’s what spiritual growth is all about. Swedenborg also emphasizes that the good in us comes from heaven and the evil comes from hell. If we think about evil as something outside of us, then it becomes easier to push it away rather than accept it as part of ourselves. Regarding the second question (referring to Ephesians 2:8), Jonathan explains how the importance of good works and charity lines up alongside the idea of repentance and salvation by grace. Swedenborg emphasizes that while only God can save us, we can’t just sit around and wait for grace; we have to meet God halfway by choosing to do good. 8. Does Swedenborg write about other types of intelligent life in the universe, like humans? I wonder if extraterrestrials would also be spirits just like us and exist with us in the afterlife? The short answer is yes. Karin Childs explains that according to Swedenborg, the universe is full of humans—they may not look like us, but they are people too, and they also can go to heaven. This can be a challenging assertion for readers of Swedenborg, because we know that many of the planets that he describes as being inhabited actually aren’t. There are many theories about why he might have written about meeting extraterrestrials on planets that we know or believe hold no life. For instance, he might have been writing symbolically, or he might have been mistaken about which planet the spirits were from, or that the planets might have been inhabited long ago but now aren’t. But if you’re willing to suspend disbelief, Karin describes what Swedenborg says about those different types of life. Swedenborg goes into detail about the life and culture of the people on various planets. He also says that the inhabitants of individual planets tend to stay near those planets (not traveling to other solar systems) in order to serve those people. In the case of Earth and human beings, the spirits of the people in heaven are organized in the same way as the human body—forming one Grand, or Universal, Human. 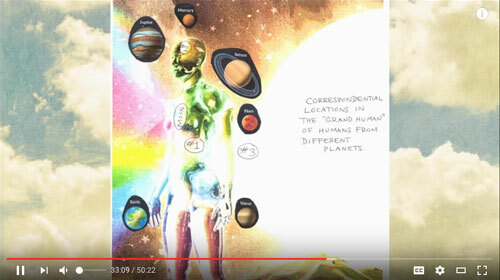 But Swedenborg also mentions an even larger Grand Human where people from Earth are only one part of the whole. 9. When I seek counsel for something to see if it’s wrong or a right thing to do, how do I know whose voice is guiding? Good or bad influences? Swedenborg says that good is not interested in doing evil or even condemning evil actions, so, as Curtis explains, if you’re experiencing some kind of inner counsel that makes you feel bad or guilty for your actions, it may actually be coming from an evil source. Oddly, evil takes the most pleasure in calling out evil, while good tends to ignore it. Also, Swedenborg indicates that good spirits are less likely to give you direct instructions. Angelic sources tend not to lay on the doctrine or command you to do specific things. Determining where his thoughts and experiences were coming from was one of Swedenborg’s biggest personal challenges. While we don’t have details on how he figured it out, Curtis offers some suggestions from his own spiritual journey: Take a step back and see what the ultimate purpose behind the thought is. Ask yourself, “Is this leading to a good end?” Does it make you feel better or worse? He has found that the most valuable insights, even when they’re self-correcting, contain a feeling of hope and optimism. 10. Is anger evil? How do we combat anger issues? Chelsea does not think anger is evil. It’s a symptom that’s telling you about yourself and what you care about. Swedenborg identified heavenly anger as zeal, which flares up when necessary and then dissipates. Hellish anger is more likely to linger and keep you angry over a long time. If we approach our own angry emotions from a heavenly perspective, we can thank it for what it’s telling us and then act based on what we’ve learned. The important thing is to stop and reflect before we let the anger come out in action.